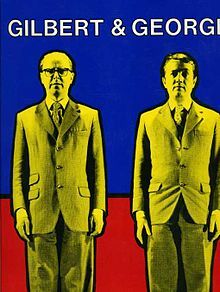 Gilbert and George are to London what General Idea was to Toronto and the Guerilla Girls are to New York City. Lovers, iconoclasts, provocateurs. They once stood as mannequins in a store window for days in a row. Unmoving. Elegantly dressed in matching suits. One sitting, one standing. Sometimes they’d switch places. No-one noticed because they’ve lived together for so long they look alike. Very few also realized they were looking at an art exhibit rather than window dressing. 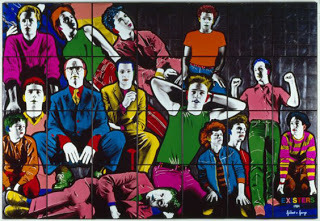 I first encountered the work of Gilbert and George at the Tate Museum on the left side of the Thames in London, before the majority of the collection there was moved to the converted power plant across the river called the Tate Modern. The plain old Tate was renamed the Tate Britian, and G&G are represented in both. For as strange, and as iconoclastic, as the two of them can be, I find their art oddly accessible. 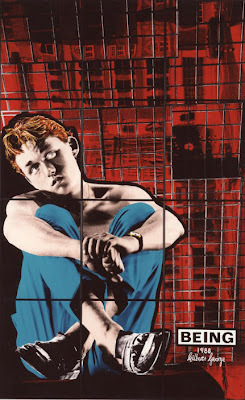 They often feature themselves in their work, and G&G see their own lives as their real art, and the pieces they produce only a component of that.